I can’t count to 180 warp threads – help! I don’t know why this is such a problem for me, but even on small loom pieces, I have a hard time counting warp threads accurately. I get started, and somewhere around 30 or 40, I lose track of where I’m at. Combine this with remembering to add the 1 extra warp thread, doubling the outside edges, and (sometimes) using Erin Simonetti’s “Trice Weaving” trick for adding an edging as you go, and things get ugly really fast. In addition to bead weaving, I knit lace. I’d literally be lost without my stitch markers, which indicate the boundaries between different sections of the lace pattern. These help me keep track of my location within the pattern, and to check that I’ve got the correct number of stitches on my knitting needles. What has this got to do with loom weaving? 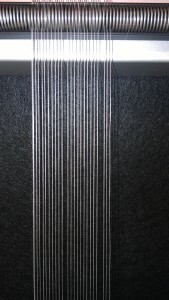 I haven’t thought of any way to add a physical “marker” to my warp threads. But I’ve been trying to come up with some sort of equivalent method for the loom, and a couple of days ago the light bulb went off. As I read through the Mirrix documentation, and a lot of other Web sites, I discovered that you can occasionally skip warp dents (the spaces between the warp spring coils) while you’re dressing the loom, without impacting the finished tapestry. I think it’s normally done if you’ve got bead sizes that don’t fit perfectly into any of the available warp coils. This is brilliant because it means I can skip warp dents while I’m warping the loom, and use the skipped spots to help me count. 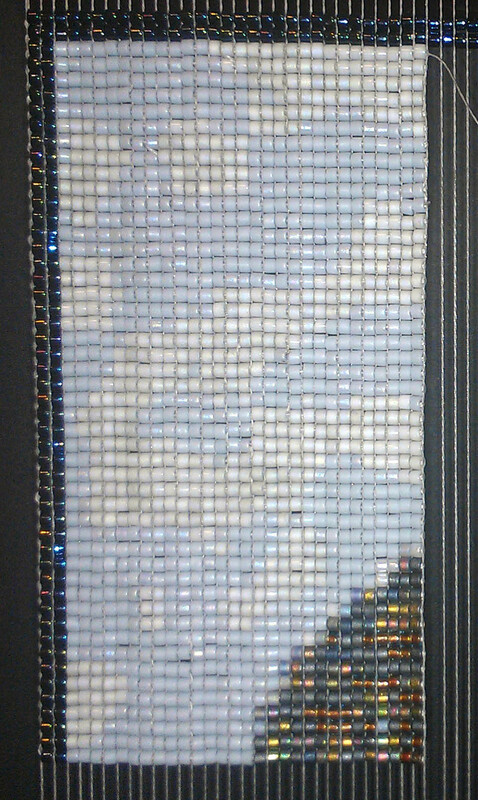 My current piece is 180 beads across. 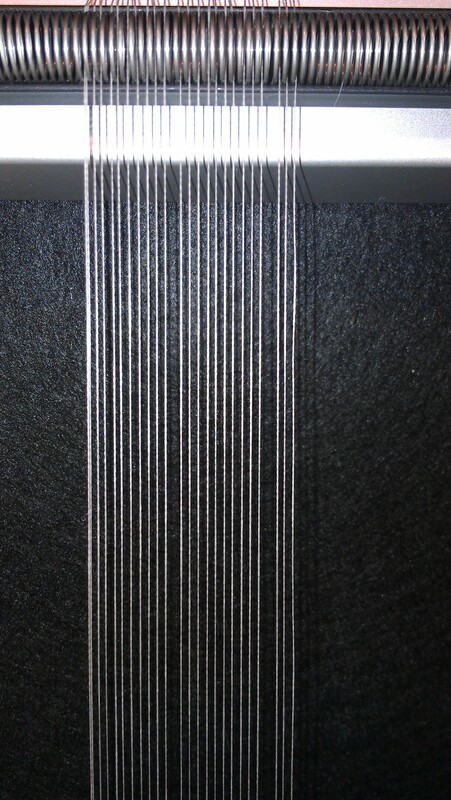 After every ten warp threads, I’d skip the next slot (on both my top and bottom coil). Now I only have to count to 18, and the gaps are easily visible. Talk about lifesavers. Today I finished the first piece of the tapestry, and as this picture shows, the skipped dents really don’t have an impact on the tension or appearance of the weaving. Today I added 1, 848 beads to the tapestry. There’s 23,940 in total, so I’m now done with 7% of the total. Yay! I cut short prices of colored yarn and insert these between every 25th and 26th warp thread at the bottom of the loom. You can mark every 10th warp if needed. Then slide the yarn to the top of the loom and tie it to the left warp. Yep, that works too. Do you mostly weave beads or fiber? I’m curious because tying bits of yarn sounds labor-intensive, but if you’re already setting up heddles etc it’s probably not much more additional work. I weave small format tapestries at 20-22 warps per inch so there are many to count. Putting a short piece of colored yarn between the warps isn’t so labor intensive if you only count the warps once. You can also place the markers while you wrap the warp. I should take up beading like you. It’s beautiful and the cats wouldn’t steal my materials like they do now.